Taste the Cracklin is a Maidstone hog roast company that’s immersed in tradition. Despite our observable professionalism and modern touch we’re a sucker for tradition, it’s hard not to be when your business and love is hog roasting. 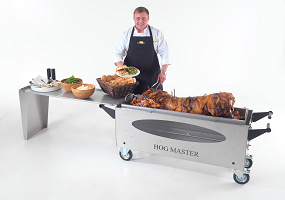 Hog roasting has changed little in the many years since it’s creation, the techniques that we use today to bring you appetising food is practically the same as it was at the very start, the only change is the equipment we hog roast with and the other foods our modern hog roast machines allow us to cook. Yes, we spit roast everything from pig to chicken and lambs, so not much change there from the historic hog roast spectacle. What has changed is that these succulent lambs, juicy chickens, seasoned sirloin of beef and piquant pigs is that we now serves them with supplementary foods. Extras like skewered-feta canapés, like profiterole desserts and like rustic, organic jacket potatoes. By introducing canapé, starter and side dishes – and who can forget the delectable desserts on offer – we’ve done the impossible, we’ve made what people thought was the best hog roast Maidstone catering even better! What makes us who we are, the spectacular hog roasters known for quality, is that we know our limitations and don’t spread ourselves thin. We’re well aware that our amazing hog roast Maidstone chefs might not have the skills that necessarily transcend to making the best canapés or desserts and so we have different categories of chefs. Our hog roast chefs focus on making the best hog roasts they can, and the second chef is free to prep desserts and cook starters. It costs us more to employ different people for different roles, but we believe in the benefits of specialisation and in wanting to give you the very best in sheer delicious food it’s the only way to go as far as we’re concerned. It’s one of the secrets to making side dishes and starters that are almost as good as our hog roasts – almost, because you can’t beat a hog roast, can you? It’s this approach and maturity we have that puts a very clear dividing line between ourselves and any other hog roaster out there. But by no means is our long list of menus and our ability to cater any event size and type the only driving force behind our notorious brilliance. So many times it comes down to the fact that we’re the only caterer that can make really juicy, tasty hog roast meals outside. Other caterers, even those who can serve outdoors, can’t do what we do, they can’t do all their cooking at an outdoor venue – we can. We’ll not only serve the tastiest spit roast outdoors, we can do all our cooking outdoors, so you’ll never miss the the theatrics that everybody loves hog roasting for. Indoors or outdoors, your guests will get to bare witness to to the grandeur of watching as our elite hog roast chef roasts your events pig, or whichever meat you choose. Taste the Cracklin catering is inclusive, and so of course our hog roasts come with a vegetarian option. The vegetarian dishes could very well come from the best vegetarian restaurant, they’re that high in quality, and they ensure that not a single person at your guest will go hungry. The dishes for vegetarians also kill two birds with one stone, because it sees those who only eat kosher or halal meat with an alternative too. We value our customers and in the spirit of giving back to all the great individuals who’ve helped to grow us to the super company of hog roasters we are now. We created a simple plan, pay us a small fee and we’ll deliver and equip you with what is unquestionably the best range of spit roast machines in the country. Delivered to you and with free gas, you can spit roast with our machines whatever you happen to like. Have a taste for chicken tikka, well season up a whole chicken and skewer it on the Taste the Cracklin attachment, turn your machine on and within hours you’ll have the best whole chicken tikka ever. With the machines you can choose what you want to cook, you have full freedom to make what you like, but you can hire a machine with a whole pig that comes with it if you’re planning on making a pig roast. Just ask on the phone and we’ll talk you through each hire choice.